Print to Digital and what is happening with Trump and Front Pages? Plus: Why Don't Print Readers Show Up In Digital? A couple of weeks ago, Joshua Benton from Nieman Journalism Lab posted an article about the scary thing that happened when UK newspaper The Independent stopped publishing in print. It's centered around this graph, and as you can see, when they stopped printing, the audience just seemed to evaporate. But is this really what is happening here, or are we just looking at it wrong? I go into the details about this in my latest Plus report, and show you why we can't just measure print and digital the same way. My point in this article is to challenge the way you think about this, because the real problem isn't what most people think it is. Now let's talk about something slightly different. I came across a tweet/article from Katie Rogers, White House Correspondent for the New York Times, talking about how Trump always wants to be in the news. When he [Trump] does not appear on the front page of his favorite papers, two former aides said, he has made it a point to do or say something to get there the next day. We all know Trump and so I'm not even remotely surprised by this, but I did find this whole thing a bit weird, because... when is Trump not on the front pages? Wait...what? Has there ever been a time where he isn't on the front page???? It seems to me that any time I visit any of the larger US newspapers there are at least a handful of stories about Trump. If I go to CNN right now, and just search for 'Trump', he shows up 11 times, including six of the seven top-most articles. And it's like this every single day. It's the same if I go to the Washington Post. Here he shows up 19 times, including (again) many of the top-most articles. When is he ever not on the front page? As it happens, Oren Levine, Director of Innovation at The International Center for Journalists (ICFJ), has tracked this. He has created a Twitter bot that checks the largest US news sites every single day, and simply tweets out how many times Trump appears ... and it's amazing. As you can see, this is not a complete list, and there is always the question of how accurate the numbers are. I did spot check, and I found it was usually pretty close to what I would see. So I asked Oren if he could give me a graph for this, and he did. This is the number of mentions of Trump on the front pages of Washington Post, New York Times, CNN, and Fox News (and the red line is the average across them all). As you can see, the New York Times massively leads the pack, but I wouldn't put too much into this since that can also have something to do with how they write their headlines. But think about how crazy this is. We are talking about a consistent level of 10-20 mentions of Trump on the front pages, every single day. This got me thinking. How did US publishers cover Obama back in the day? Are we just perceiving a difference because of Trump, or is it actually different? To check this, I went to the Internet Archive, where you can see the history of what any website looked like in the past, and I looked up the New York Times. 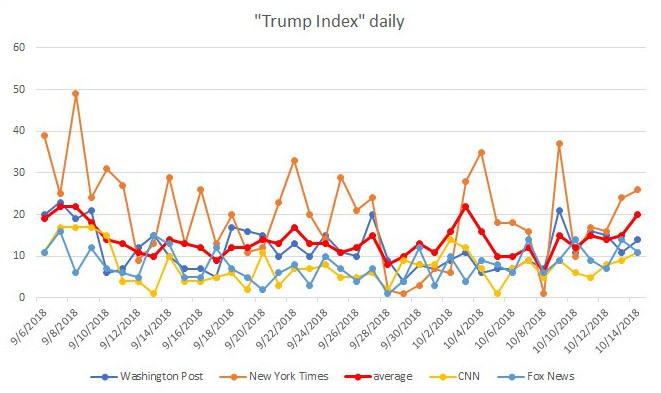 I have used the same y-axis scale as before so that it's easier to compare, and there are quite a few days where we don't have any data (the light gray days), but as you can see, the number of front page mentions of Obama averaged about 2 per day. That's a big difference. But, wait a minute, you might say, this might be because of political bias. I don't quite agree with that, but okay, let's look at Fox News instead. How many articles did they post per day? Well, the result is an average of 6 front page mentions per day. I have a few notes about this. 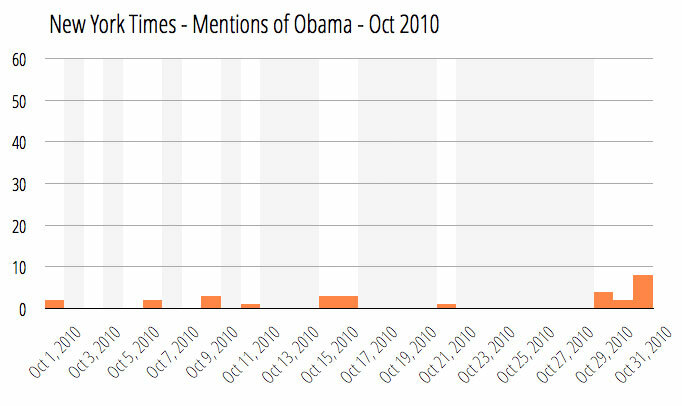 First of all, what I did was merely to count the number of mentions of 'obama' in any context. So, any mention of Obamacare is also included (in both graphs). I was thinking about excluding these, but when they were writing about Obamacare they were also talking about Obama, so I kept them in. Secondly, these numbers are a bit deceptive, because they don't illustrate where on the front page Obama is mentioned. While today, you almost always see several stories about Trump at the very top of the page, I found that back in 2010, this was not often the case. 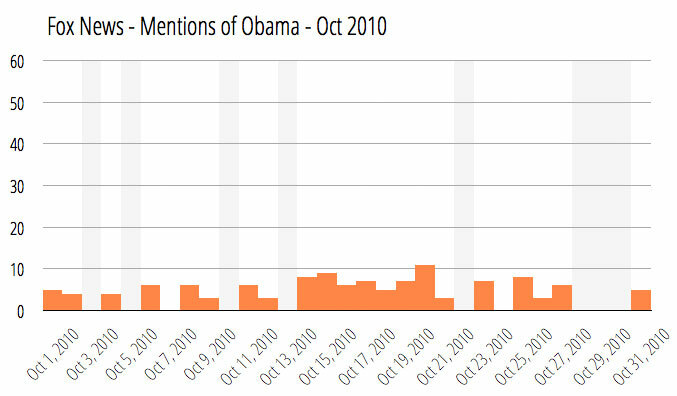 Take the day with the most mentions at Fox News, which was on October 20th, 2010, with 11 mentions of Obama. This was what that page looked like. 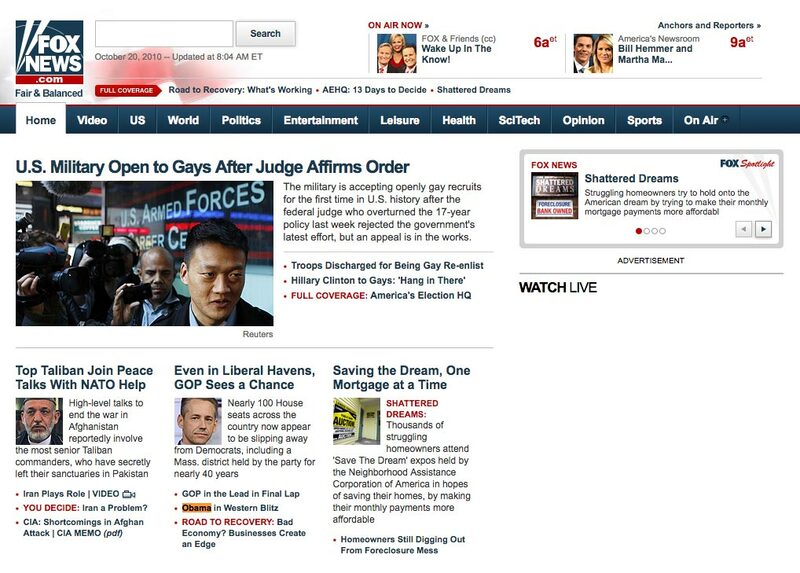 Notice that there is only one mention of Obama 'above the fold'. All the other 10 mentions are much further down the page. Obviously, I could have gone in and done a much deeper analysis of this. I could have looked at how each headline was featured and where they were placed on the page. I could also have looked at whether some of the articles that didn't mention Trump/Obama by name, might still be about them. But I don't think that it would change anything about what we can learn from this. The conclusion here is that US publishers have massively focused their front pages on Trump. This doesn't really sound that surprising, and you might argue that this is a good thing. You might say that it's because of the current US political situation and all the things the USA as a country is going through. And you might point to the increase in subscribers for both the New York Times and Washington Post as a sign that this is 'what people want'. These are all fair points, and on a personal level I might even agree. However, as a media analyst, I don't look at the world this way. I look at what this means for publishers 5 to 10 years from now. And what I see then is a problem, because the feeling you often get when you visit US newspapers is that they have turned into Trump papers. This seems incredibly unfair to say, and I also know this is not really true. For instance, at the New York Times, there are many truly talented journalists doing a very good job writing about many other things. But it doesn't change that, most of the time when you visit the front page, it's dominated by just this single thing/person. 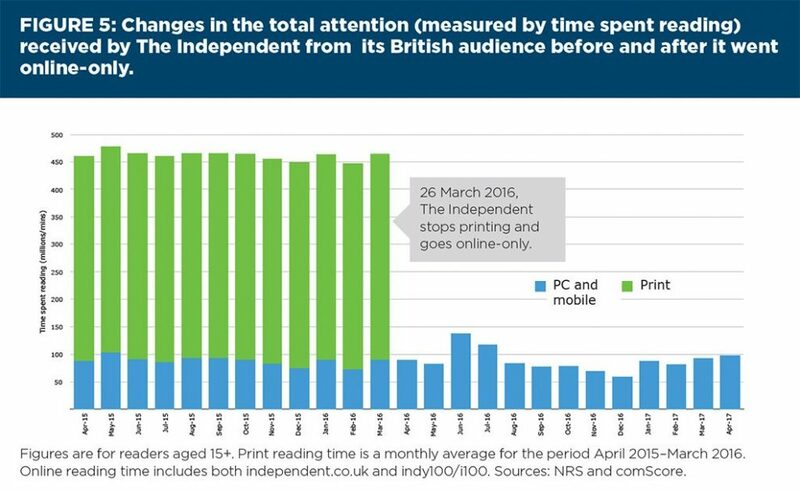 In my latest Plus report (the one mentioned above) I wrote how 'time spent' on news is in decline compared to total time online. So while newspapers like New York Times and Washington Post might say this is helping them right now, in terms of overall consumption it is turning news into a niche. There is also the problem with relevance. While the stories covered by US newspapers might be very important, they also have very low personal relevance, and it's creating a narrative where everything in society happens through the White House, which isn't the case at all. So I'm worried about this. I'm worried about the political-first bubble that now dominates the front pages. And I'm worried about what this means for US newspapers in 5 to 10 years. I'm also worried about the growing level of 'news fatigue' that I see everywhere. Think about what this means for how people think about newspapers in the future. We want the future of newspapers to be something that people want to go to. Not something they are annoyed with and wish they didn't have to spend so much time on. And if your front pages always have 15 articles about just one politician, this fundamentally changes how people think about news. One thing that also surprises me is that the midterm elections are only a month away, but I see nothing about it in US newspapers. There are tons of stories about Trump, but it's like the midterm elections don't exist. 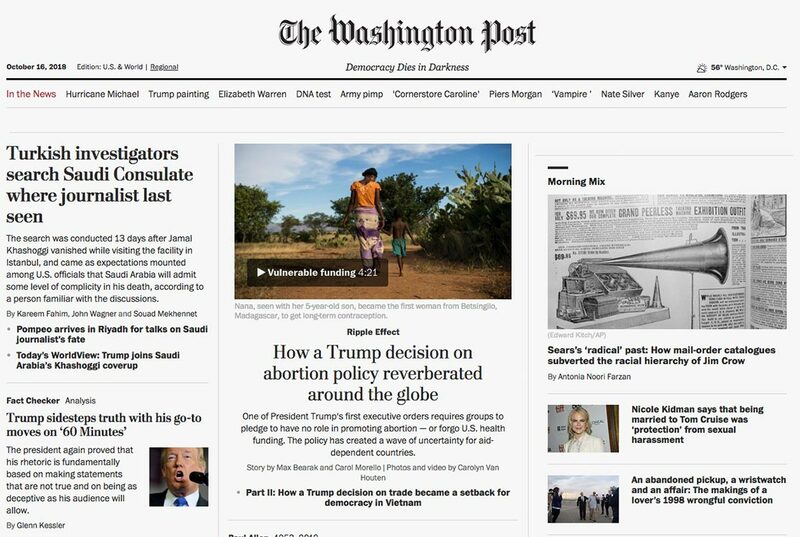 The Washington Post has this great motto saying: "Democracy Dies in Darkness", but that's exactly what's happening here. By only shining the light on the White House, everything else is in darkness. How are people supposed to know what to vote for when this is the news? So, think about this. We all understand the economic 'potential' that is happening here, but how will this affect news consumption in the future?